This Dutch process is a treatment of the chocolate product with alkali, usually potassium carbonate. Cocoa beans have a pH of approximately 5.2. The treatment with alkali raises the pH of the finished product to 6.8 and higher. 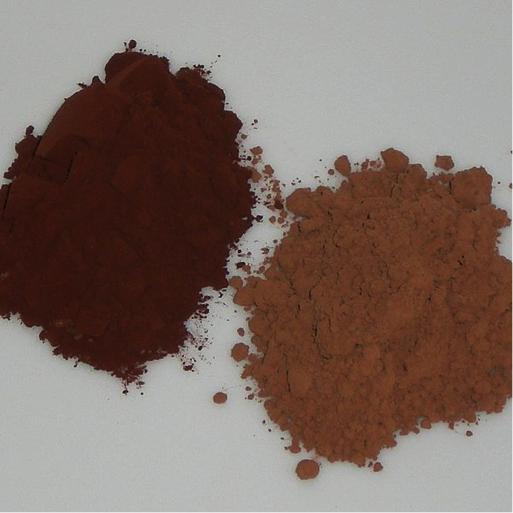 The process affects the flavour and colour of the chocolate product. Alkaline solution is generally applied to the raw beans or nibs but not to the liquor. If alkali is used in the cocoa liquor, it tends to react and leaves a soapy flavour. Because Dutch cocoa has a neutral pH and is not acidic like natural cocoa, it cannot be used in recipes that use baking soda as the leavening agent, which relies on the acidity of the cocoa to activate it. Rather, Dutch process cocoa can be used in recipes that use baking powder for leavening. Figure 12 Dutch process and natural cocoa. Dutch Process Cocoa by go2HR is licensed under a Creative Commons Attribution 4.0 International License, except where otherwise noted.